Anyone who likes fast-paced experiences and fast cars should visit the Exotic Rides Cancun. Here you get the chance to sit behind the wheel and swoop up in one of the coolest sports cars in the world. There are plenty of models with everything from the classic red Ferrari to the latest Audi. The staff are very knowledgeable and instruct well so that you can safely run different sports cars. If you’re lucky, you’ll get a real NASCAR driver instructor. The entire centre is very cool and has been decorated with great detail, and you can also eat or have a drink in the bar. You’ll get a different kind of pitch-and-put experience at the Pirates Minigolf where players make their way across nine challenging holes in an environment that revolves around pirates and piracy. The courses are indoors, which puts an emphasis on the interior, the sound and the light effects. All paths are lit in neon-like colours in a cool 3D environment there are various sounds and noises everywhere. In addition to the golf course, there are also several other games to entertain yourselves with. Among other things, you’ll find Air Hockey, Billiards and different football and basketball games. If you want to begin or end your visit with a meal or a drink, there’s also a restaurant. 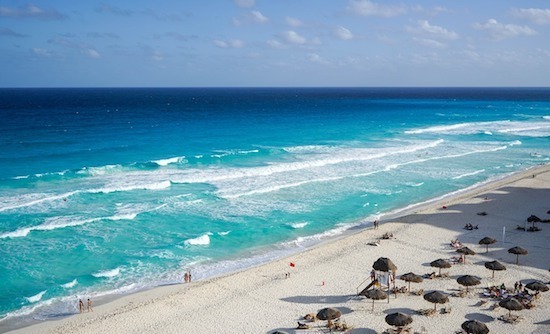 One of the best beaches in Cancun is Playa Delfines. Here you can enjoy life on a bed of soft, white sand while looking out over the beach for an amazing view. The water is a perfectly clear blue and the waves lap serenely towards the shore. A great reason for Playa Delfines being a good choice is that it is far away from large hotel complexes next to the beach and it is not usually completely packed with people. The beach is also clean and well maintained. The easiest way to get here is by bus from the central parts of Cancun. Parque Urbano Kabah is a beautiful park in Cancun, which is ideal for taking a relaxing walk. There is a beautiful promenade along which you can explore the park’s flora and fauna. The park is located in a place where they have chosen to preserve parts of the former Cancun and there is a small section where one can learn more about the city's history. In the park, there is also a playground for children and various training equipment for those who want to exercise. It’s a good idea to bring mosquito repellent since there are mosquitoes in the park. In the Maya Museum in Cancun you’ll get the chance to learn more about the Mayan people, who had their heyday around 2,000 years ago, and see remnants of their civilization. The museum consists of a main building and an archaeological site located just outside. Inside the museum, there are three parts, two of which are permanent and have various exhibits. In the first part you’ll see different archaeological objects from the state of Quintana Roo and what is displayed is really fascinating. Among other things, you’ll also find the skeletons of La Mujer de las Palmas (freely translated as "Woman of the palm trees") who is believed to have lived more than 10,000 years ago. The second part of the museum is entirely focused on the Mayan culture and you can learn more about the Mayan calendar as well as a variety of other interesting parts of the culture. The exhibitions in the third section change all the time, but it has previously included an exhibition on different Mayan masks. The archaeological section includes fascinating remains from forty buildings and a large pyramid. The place was populated by the Maya people until about 800 years ago when the Spanish conquerors took the field. Chichen Itza is a large archaeological site of Mayan allotments. The location was a major part of the Mayan civilization and consists of several fascinating buildings and allotments. Some of the amazing work that is on display is the castle El Castillo, ball field Juego de Pelota, the warrior temple Los Guerreros, the Observatory Caracol and square Mil Columnas. Chichen Itza is on the UNESCO World Heritage List and is also considered to be one of the New Seven Wonders. When you visit this archaeological site, you must remember that it’s a very popular tourist attraction, and it’s often very crowded. To avoid the worst rush, you should try to arrive early in the day before the tourist buses start arriving. From downtown Cancun, it takes approximately two and a half hours to get here by car or bus, so be sure to be up and out in time. With its beautiful beaches and wildlife-rich sea life, Isla Mujeres is a place you should not miss. Isla Mujeres is located off Yucatán’s northeastern tip and is located about half an hour’s boat ride from Cancun. The island is full of attractions and it is difficult to be idle. If you don't visit any of the island’s shops and restaurants, you can indulge in some more sporty activity. The island offers everything from diving to fishing and the possibilities are endless when you’re there. There is also a lot of cultural life with museums and historical sites. A cenote is a sinkhole which can be likened to a natural "basin" created when limestone bedrock collapses and the ground turns. Cenotes are very common in Central America and historically have been used primarily as a source of water, but also by the Mayans for religious sacrifices. Since large parts of the bedrock consist of very porous limestone, there are approximately 7,000 cenotes around Cancun and Yucatán. There are both underground cenotes and cenotes located at ground level. To find out where you can swim, it’s important to inquire at the hotel or other places where you can get tourist information. There are also different tours where you'll have the opportunity to visit various cenotes in the area around Cancun. Kukulcan Plaza is a huge shopping centre with three hundred different shops which also offer a variety of entertainment. There's bowling, several restaurants, a cinema and even art exhibitions. Opening hours are 10:00 to 22:00. Plaza Caraco is another large shopping centre with just over two hundred shops on two floors. The architecture is very beautiful, with a large, plant-filled atrium and marble floors. Here you'll find designer fashions from world-renowned brands, but also traditional Mexican crafts and arts. Opening hours are 8:00 to 22:00. Flamingo Plaza has several international shops and restaurants. Among other things, you'll find the well-known restaurants Outback and Planet Hollywood. Opening hours are 10:00 to 22:00. La Isla is one of the newer shopping centres in Cancun. There are different shops and restaurants outside. The ambiance is nice and there is also a large aquarium on display. Ki Market Huic is Cancun’s oldest market and together with Mercado 28 is one of the biggest. Here you can find bargains among approximately a hundred different stalls and souvenirs are sold mainly in the form of clothing and decoration. Ki Huic Market is open between the hours of 9:00 and 22:00. Mercado 28 is a large market in the center of a large sale of several types of goods. The market is one of those who may feel most Mexican and here you’ll find pottery, jewelry, clothing, rugs, blankets and other handicrafts. There are also a lot of foods such as spices, herbs and traditional health food. Of course there are again a lot of souvenirs. Malhula is an area along the coast where much of the typical traditional environment of the old Mexican fishing villages has been preserved. Mahahual is also called "The Heart of the Mayan Coast", and is one of the places where you can really get a sense of how the coastline along the Mexican coast looked like before tourism arrived. Here there are no hotels and shops and streets full of people. Instead, it smells of the rainforest and the sea breeze that dominates. You should turn off your mobile phone, relax and be at one with the Caribbean marine environment. If you come here you should dress lightly and be sure to have your swimsuit handy. It is full of beautiful places where you can sit down for a while and take a dip in the blue. Mahahual is located about four and a half hours’ drive from Cancun.